What Does The Bruins Lineup Look Like When Healthy? The Bruins finally look to be getting fully healthy. With Jake Debrusk, Zdeno Chara and Kevin Miller all nearing their returns, the Bruins will have quite a few lineup and roster decisions to make. With the addition of the four injured players, the Bs will have 14 F and 8 D, with only 21 slots for skaters on the roster, the Bruins would have to make a tough roster decision. We recently learned that Jeremy Lauzon and Urho Vaakanainen have been sent down to the AHL which makes sense. They’ve both stepped in and played very well when they’ve been asked to, at this point the two are no better than any of the Bruins current top 7 and would be better off getting a lot of minutes in the AHL. The only players on the Bruins that don’t need to go through waivers when sent down are Charlie McAvoy, Jake Debrusk, Ryan Donato and Jakob Forsbacka Karlsson. The first two obviously don’t have a chance to get sent down. With the very strong play and increase in confidence and the strong play of the latter two, I don’t want to see either of them going back to Providence. However, there is a decent chance of JFK getting demoted. I’d say that leaves Noel Acciari, Colby Cave, JFK, and Steven Kampfer as the final “contenders” of getting sent down. This decision is based on if Cassidy wants an extra D or forward. Cave has found his groove and is really stepping up his game as of late with his two points showing against the Canadiens last Monday. We’ve seen a lot more offense and consistency from Cave and would be a lot more attractive for another team to claim on waivers than a guy like Acciari who has one point all year. I’d like to see the Bruins hang on to Kampfer rather than Acciari because it seems the back end is a lot more prone to injuries than the forward group. Chances are JFK gets sent down simply based on the fact that he doesn’t have to get through waivers, but for the good of the Bruins right now, he’s deserved a spot on the big club over Acciari. So now that I’ve speculated on the roster moves, it’s time to move onto the lineup. I think it would be worth a shot to entertain the option of keeping Krejci on the top line, but ultimately, I think the Bergy-Marchy combo may be too much. Now that the two are continuing to build on their chemistry, I’d like Pasta and Krejci to stay together on the second line with Debrusk when he comes back. That obviously leaves a hole on the first line, and a couple players can fill that role. 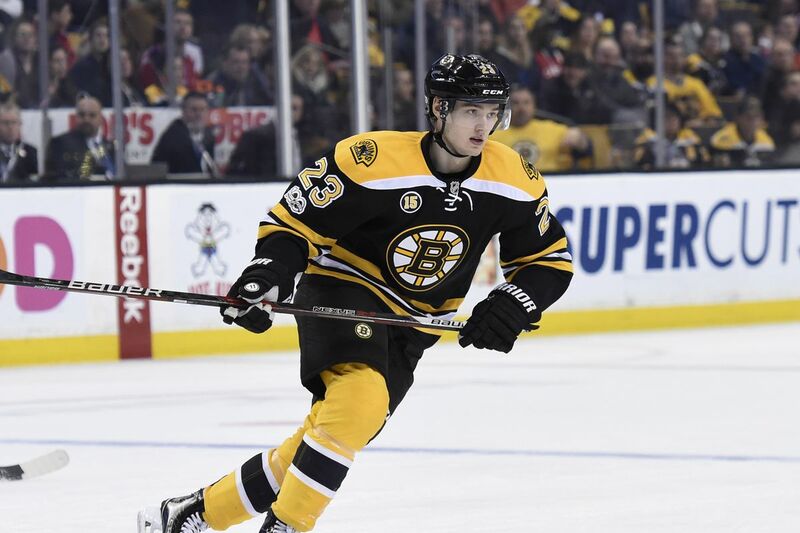 There are two options, if they are lacking in scoring, I think Ryan Donato who has looked much better since getting recalled should be given a look on the first line. We’ve seen that Bergeron and Marchand can elevate anyone’s game and I think it could do wonders for Donato’s. If the Bs are looking for more of a two-way style, Danton Heinen could fit very well. He filled in last year on the top line for a few games when Marchand was suspended and filled in well, again it could be great for Heinen to develop his game with some of the best. With that as the top 6, the third line starts to take shape. JFK has looked a lot more comfortable as of late and seemed to have taken a bottom six center job, but with Bergeron back, he was just recently a healthy scratch for two straight games. The young Swede might have to take a seat in the press box. The Bruins have entertained the option of having Joakim Nordstrom play center, but due to his sub-par face-off percentage, he’s likely to continue to play wing. As I previously said, Colby Cave has earned a spot on the team with his strong two-way game and sparks of offense, he would be a solid option on the third line for now. David Backes, who has looked great recently, would be a good fit on the line as a defensively reliable “bodyguard” type of player for the younger players on the line. That leaves Sean Kuraly, Chris Wagner, Nordstrom and JFK vying for 4th line minutes. Nordstrom has been outstanding all year and has been a swiss army knife for Cassidy with all of the injuries, there’s no reason he shouldn’t be playing. Wagner and Kuraly have played very well together and have garnered some chemistry so I think the two should fill out the 4th line. That all leaves JFK as the 13th forward to fill in wherever is needed. I think if any forward anywhere in the lineup goes down or needs a quick rest, Cave and Nordstrom can fill in admirably, Cassidy should just ride the hot hand for the rest of the year. With the forwards done, it’s time to look at the defense. There are four D that should play every night without question. Those being Zdeno Chara, Charlie McAvoy, Torey Krug, and Brandon Carlo. 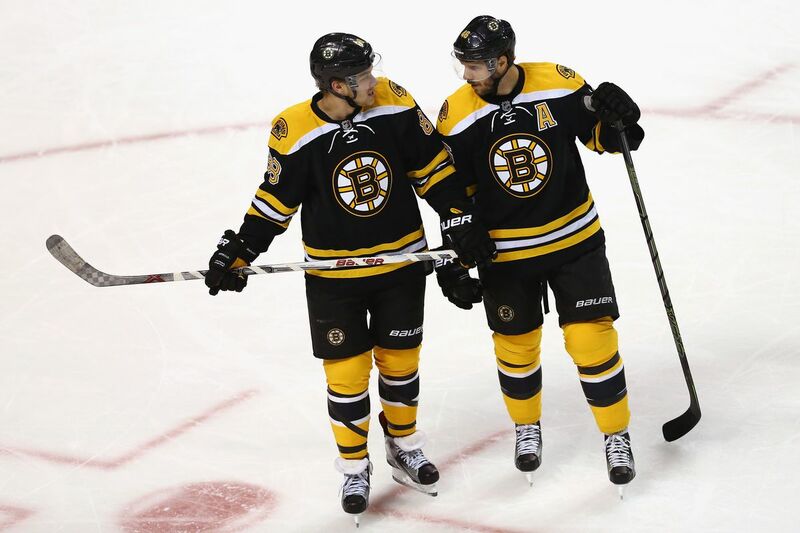 The first pairing of Chara and McAvoy proved last year in the playoffs that they could shut down the best of the league, leaving the Maple Leafs and the Lightning (for most of the series) looking for more out of their stars. Krug’s offense cannot be replicated on the blue line, and Carlo has really come out of his shell this year, adding more grit to his game and continuing to improve on his already sound defensive game. The final defensive pair would consist of two of John Moore, Matt Grzelcyk and Kevin Miller. I think Grzelcyk and Moore have been the Bruins unsung heroes this year. They both proved they can play very well in roles playing 25+ minutes a game and a more condensed role will only make them look better. Kevin Miller brings a physical side of the game that the majority of the roster can’t match and while I think the Bruins don’t need to go out and get an enforcer, that grit is incredibly important on the blue-line. For this final pair it will probably go on a game by game basis, whoever is playing the best gets to play unless Cassidy wants to play Miller against more physical teams but may want a bit more offense and play Gryz and Moore. If I had to pick the final pair I would choose Gryz and Miller, I think Grzelcyk’s hockey sense is too good to sit in the press box. With all that being said, the Bruins lineup decisions aren’t necessarily a bad thing. With all of the depth on the back-end, Cassidy can pick and choose his matchups on a day to day basis and know that he will always have a solid six guys to roll out there. For the forwards, they have a lot of flexibility. Backes has been really solid as of late and can fill in any of the four lines. If Cassidy needs a goal, he can put Pastrnak back with the top line and switch the rest of the lineup accordingly. All four lines have big strengths to their game, and I feel if the Bruins get enough out of their younger players, this lineup has the potential to do wonders. What do you guys think?